My sister texted me this morning and said, "Your fans want an update on the townhouse." After I picked myself up from the floor laughing, I thought I probably should update, well, her anyway. Jenn, this is for you! After ending Week 3 so discouraged, I decided that Week 4 needed to be productive. 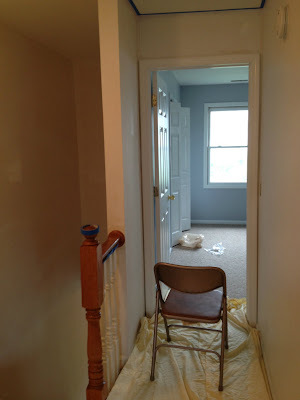 I still had bathrooms that needed to be painted, so I took a deep breath and headed in. I wasn't entirely sure I would survive those bathrooms, but, good news!, I did. I started out on Monday with the primer. I have discovered that primer gives me a wicked headache, especially in small, enclosed spaces, like bathrooms, but the job needed to be done. There was no way I was going to be able to cover the pukey brown color with a sweet shade of light gray without primer. So Monday was priming day. And, lo and behold, I got one of the upstairs bathrooms painted. 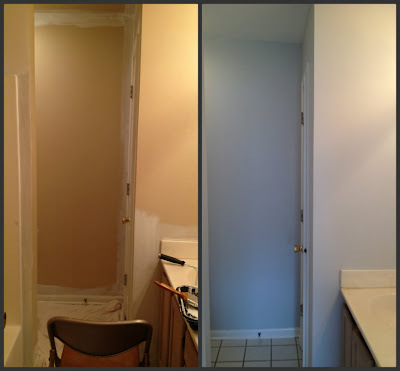 Here are the before and after photos of the "master" bathroom. I also painted the other upstairs bathroom, but didn't think you needed to see a picture of another bathroom painted the exact same color. Needless to say, things are definitely freshened up in the bathroom areas. 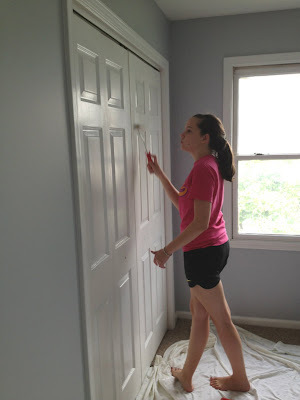 My helper came, too, last week, and worked on doors and trim. Julia is becoming a pro painter! I also worked on the hallway--priming (why, oh why, did I decide to cover all darker colors with lighter ones? ), painting, and trim. 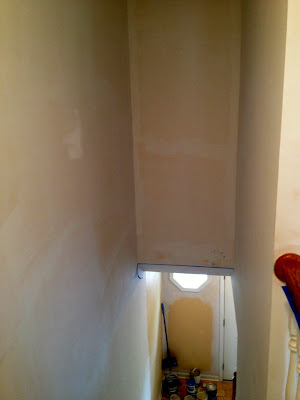 Because I'm terrified of ladders and had no way to reach the highest parts of the staircase, I let my friend, Ken, who's been helping me with some repairs, take care of that. These pictures show just the beginning stages--it's all done now--but you get the idea. Week 4 ended completely differently from Week 3. I was so discouraged the week before, but at the end of Week 4, look who showed up again! Really, bless her. She is amazing. This week she told me she'd help me tackle the kitchen, so, after traveling about an hour and a half on the El and the Metra, she grabbed a bucket and got to work. Speaking of love, I think I'm developing a crush on this product. My sister introduced me to Simple Green when she was here, and I'm pretty sure it has changed my life forever. 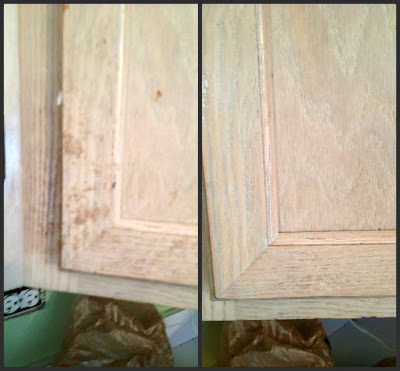 Just look what it did to these nasty cabinets! Glenda was impressed, too. She's pretty much a pro-cleaner and she said it was great stuff. Somehow I believe her. While Glenda was working on the cabinets, I tackled the half bath on the first floor. Seriously, this bathroom is probably 3' x 3' but still it took me an hour and a half to clean it. I feel like such a grownup because I am now the proud owner of a grout brush. This little tool only cost me a buck and it is totally worth every one of those 100 pennies. Just look at this picture (turn away if you want--it's gross). 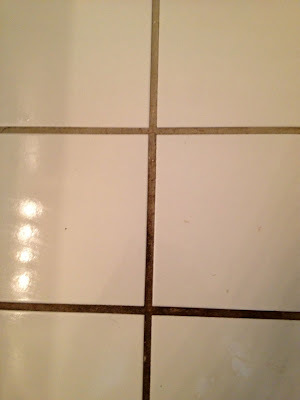 The grout at the bottom of the photo hadn't been cleaned yet, but the grout at the top had been cleaned with the brush. What an amazing difference! 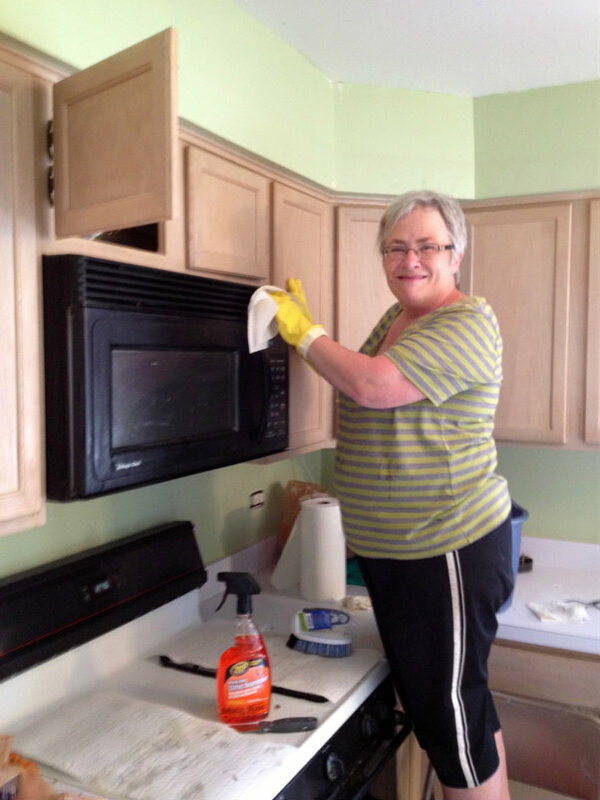 Even after a full day of scrubbing, Glenda had a little bit of goodness left in her. Since she still had some time before she had to catch her train, she decided to tackle the stove. Honestly, I don't think the thing had been cleaned, like, ever. Now, if you're not feeling great, you really might want to turn away because what I'm about to show you will truly make you sick. 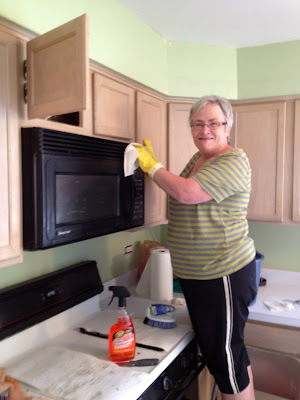 You know how you can lift the top of the stove to clean underneath the burners? Yeah, well, you can. (Apparently our previous tenants didn't know that either.) When we lifted the top of the stove we found about a quarter of an inch of grease, along with lots of popcorn kernels, M&Ms, pasta, and crumbs of various sizes. 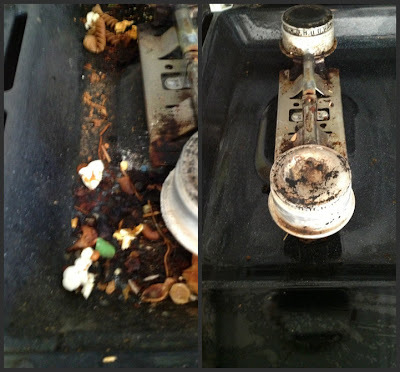 The good news is that, as you can see from the picture on the right, we were able to clean out all of the crud. It's a miracle that the place didn't burn down, don't you think? All-in-all I'd say that Week 4 was a very good week. I still have a ton of painting to do, but I'll get there. I'm starting to see a tiny pinprick of light at the end of the tunnel. So tell me, what have YOU been up to?? I miss you all. I had so much fun lending a hand and spending the day chatting as we worked. I am glad you captured that crazy nasty stove picture. Wow. Keep up the good work, friend. Soon you will be done. ps. 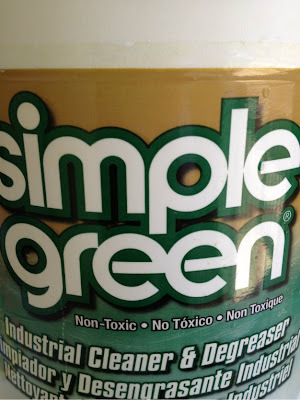 I love Super Green. I am a fan! 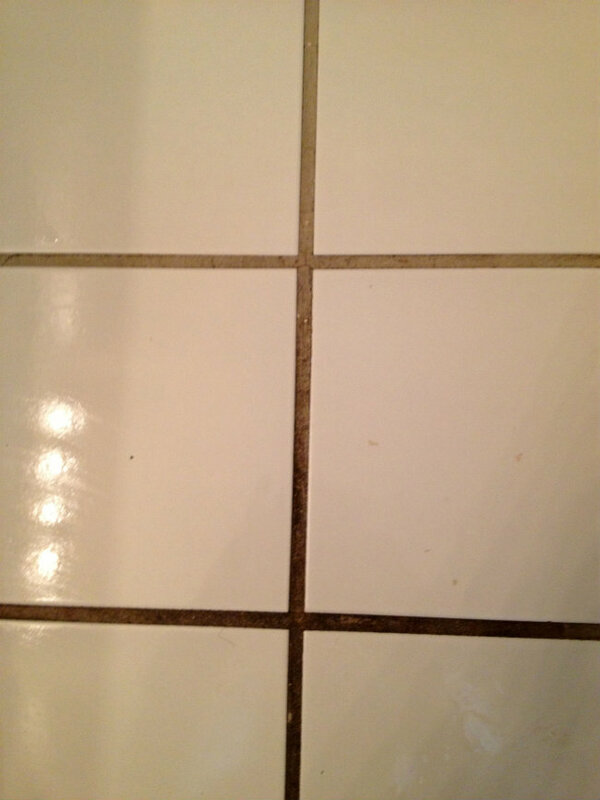 Pictures of clean things make me happy. I need to believe that disgusting messes can be redeemed. (Metaphor for life!) Thanks for the update. 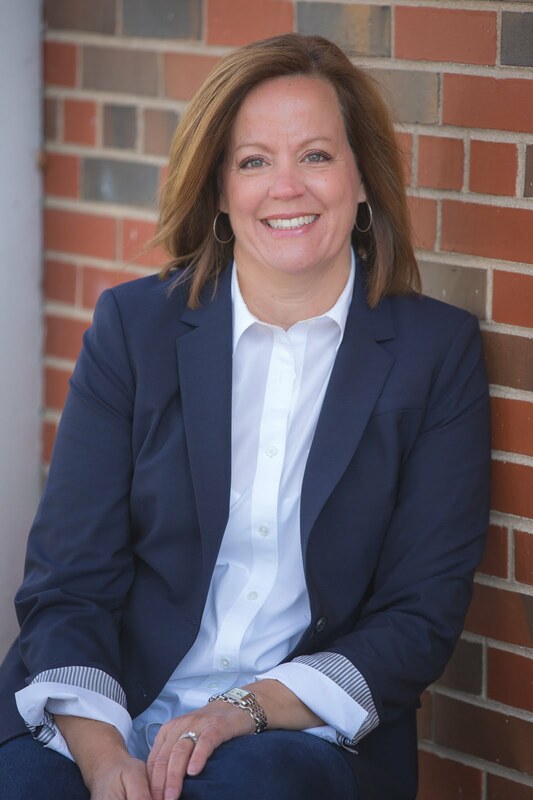 You rock, Shell! You may not feel it, but you’re making great progress! Just think of how spectacular it’s going to be in just a few weeks when you do the big reveal and the girls move it. And Glenda. I haven’t met her but I know I love her because of her sweet, cheerful smile and her servant heart. It takes a very special person to want to tackle that awful kitchen … Believe me. I saw the “before”. You're doing great! Everyone should have a Glenda in their life. I'm going down tomorrow to paint with my daughter at our rental house. I don't know how you're doing it. It takes me about a week to recover from just painting! Whew, you've been B U S Y! Guide to Being Busy talks about. Wish I was closer to lend a hand. Glenda is such a gem!